The 44 metre motor yacht Bliss, listed for sale by Ocean Independence and Cube Yachts, has been sold with Torrance Yachts introducing the buyer. 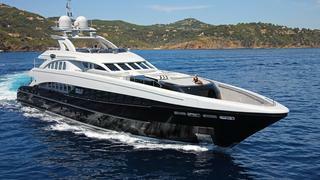 Built in aluminium by Dutch yard Heesen to ABS class and MCA compliant, Bliss was delivered in 2007. She can accommodate up to 12 guests in five comfortable cabins including her majestic master suite. The limited colour palette of white, black, silver and dark lavender is incorporated effectively in the full-width master suite located on the main deck. A sliding bed table is a practical element of this elegant suite. Just aft of the master suite is an office space with his-and-hers workstations. The remaining cabins are located on the lower deck and include three doubles and a bunk room perfect for children, fitted with rare onyx, offset by rosewood. Each cabin has a different colour scheme executed in exotic wall coverings, and all are extremely soundproof. Her main saloon sets the tone for the rest of the yacht’s interior. It features contrasts in hard and soft colours and textures with quality furniture and a unique finish. The elegant dining area with a circular table and stylish black leather chairs is located back toward the main deck aft. The upper lounge features a long, mirrored bar and mirror insets between the windows cleverly providing a profusion of light. The upper saloon can also be used as an extra guest cabin. Twin 16V 4000 M90 MTU engines provide a range of 3,200 nautical miles at 12 knots and she is fitted with Naiad zero speed stabilisers. Bliss was asking €14,990,000 with VAT paid.